A body can get bored quickly riding along the same trail week after week. I think the term is cycle fatigue or trail fatigue or some such silliness. It happens though when you do the same exercise or routine frequently. As much as I love to ride and work out, I do find that unless I have a goal or end spot in mind, I can't bring myself to head out to the gym or the trail with the enthusiasm I had a year ago. Once I'm in motion, all is fine. It's getting started that I find dull. So, on Wednesday afternoon I headed over the Benjamin Franklin Bridge and into Camden; a woman alone on a fancy bicycle. How's that for adding a little spice to my ride? Camden, the notorious den of death, drugs and destruction, a mere 4 miles from my cozy neighborhood of shootings, drug wars and debris strewn streets. Not all that much different I suppose... In actuality, the ride to New Jersey (a whole state away!) was kind of cool and eye opening. 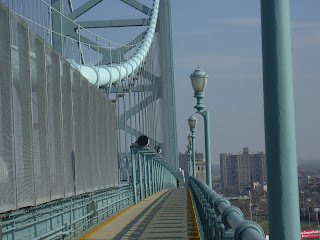 It doesn't take long to cross the bridge and my vertigo aside, it's great exercise to ascend the bridge as it rises up over the Delaware River and then gently descends down into Camden. What a difference a faster and lighter bike, 20 pounds or so less on my frame and no winter winds blowing in my face makes. I took this little cycle tour back in February with Susan Hill, and I could barely make it back to Philadelphia I was so winded and tired on the climbs. Factor in all the good changes I've made, the trip was, ahem, a piece of cake! Oh, what I would give for a tasty piece of chocolate cake...mmmm Cake. I digress. As long as I stayed in and around the Rutger's campus, near the Camden River Sharks Campbell Soup Ballpark and along the Riverfront walk, I felt fairly safe. It's easy cycling, as there are not many buildings or obstacles along the way. Reaching the river walk is direct, unlike on the PA side at Penn's Landing, where you navigate the autobahn and take your life into your hands just to get across the mega highway that is Columbus Boulevard aka Delaware Avenue. The New Jersey side of the Delaware is cleaner, well-thought out and planned with people wanting to do things in mind. There is the NJ State Aquarium, the Battleship New Jersey, the Susquehanna Arts Center, Wiggins Park, a Marina, where you don't need a special pass and a gazillion dollars to be allowed into, and there are benches and places to just sit. The river is as dirty in NJ as it is in PA. I saw huge pockets of trash and all manner of plastics washed ashore or along embankments. Trash aside, and it should be cleared and put aside in a more responsible way, the Camden River Walk has life and energy that the Philadelphia side clearly lacks. I've read stories and hear things on the bicycle blogs about an effort to transform Columbus Boulevard and Penn's Landing into an urban oasis for the City outdoor enthusiasts. I hope it happens in my lifetime while I can still ride a bike and before I'm pushing around on a Rascal Scooter or other motorized wheelchair unit. Aside from being a wee bit concerned about my safety riding alone in Camden,honestly, I feel just as unsafe in Philly, I was happy to be able to ride along the river and just enjoy the car-free and mostly jogger free trails. After this week's Philadelphia Inquirer article about Kelly Drive being over-crowded and the problem with my fellow cycling enthusiasts, taking a trip to Camden feels like a joy ride.